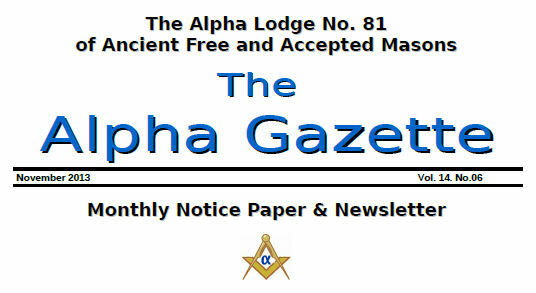 Back on the 25th of September last year I received an email from Geoff Mather, who drops me the odd email; on one ocassion telling me about a great publication that he reads each month from the Alpha Lodge up north. I asked him to email me a copy - which he did a couple of days later. I opened the copy of the Alpha Gazette he had emailed me; and that was it for the rest of the night! I ended up reading all 11 back issues on the website. By the end of the night I just had to email John and tell him what a fantastic job he was doing of the Gazette. After re-reading some of the issues I decided I needed to tell the world about John so I included an item on him, and his work in our November e-Newsletters last year. You can read the item here (scroll to the bottom of the page to view the item). Although very active, John is now retired and I must admit to being envious at the amount of spare time he had to compile some of his more 'in depth' items. I didn't think much more of it until I heard through the grapevine in early July that John's involvement with the Alpha Gazette had tailed off. So who is John Barns Graham and what is his Masonic background? It is hard to believe that John has achieved so much despite having only joined the Craft in June 2001. His Masonic Bio reads like some of our brethren that have been in the Craft for more than 50 years. I am staggered at what he has achieved. You can read John's full Masonic Bio by clicking here. 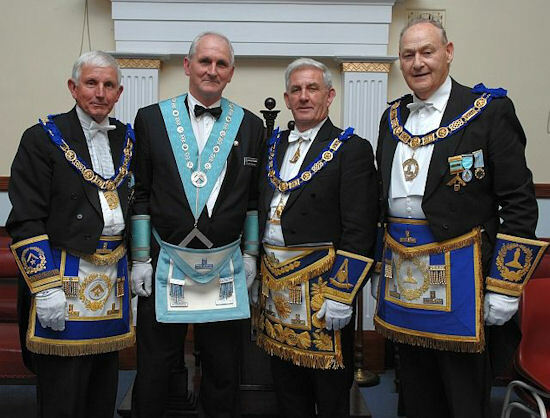 So with a Masonic Bio that reads like a Citation for an OSM what about the man behind the Mason? Well... to be honest... it reads much the same way; John has enjoyed a life of high achievement, always striving to do the best he could in whatever challenge he took on. 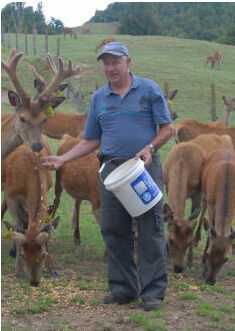 You can read about John's life by clicking here; but be prepared to have your breath taken away! The picture of John below is my favourite. It was taken at his first Installation as Master, and includes Warwick Roberts, the late Barry McLaggan and Jim McQuitty. half decent job of the website and e-newsletters I produce and that what I really needed was someone who could "join the dots" for me on the huge plethora of Masonic information in the public domain and on the web. Over the next few weeks we emailed each other some more and I finally managed to convince John to take the plunge and move from print to web and to help me by compiling and publishing content for my various publications. He's taken to it like a duck to water. We've had a few Skype sessions to share some basic concepts - but already John is producing like a pro.